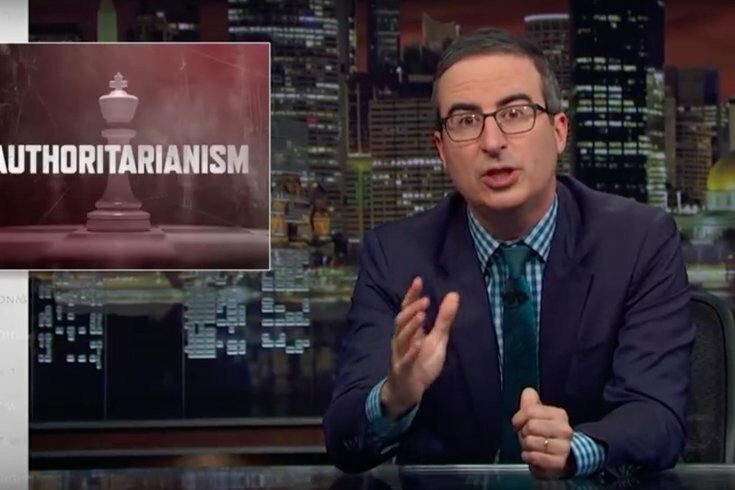 John Oliver delves into the traits of authoritarian political leaders, bringing it back to none other than President Donald Trump. To set a cheery tone right before the holidays, John Oliver's season finale of "Last Week Tonight" did not focus on the acclaimed film "A Star is Born," but, as Oliver teased, on the exact opposite: "The troubling rise of authoritarian leaders around the world." Oliver started by giving us a rundown of authoritarian leaders on the rise, including Brazil's president-elect Jair Bolsonaro, the far-right candidate who won that county's election last month. To help figure out why a third of the world is reported to be in a "black-sliding democracy," Oliver highlighted three key traits that help authoritarian leaders gain power: the ability to project strength, to demonize enemies, and to dismantle institutions. "He loves appearing strong, wanted a military parade, and when it comes to demonizing enemies, he's gleefully gone after immigrants and other marginalized groups, as well as picking aggressively optional battles with Canada, the NFL, Mark Cuban, the FBI, Robert de Niro, the 2017 Emmy Awards, Puerto Rico, the Postal Service, an upscale farm-to-table restaurant in Lexington, Virginia, the NSA, Labarbull, the city of Chicago, the Mayor of London, the CEO of Merk, Nordstrom, and Chrissy f***ing Teigan. And that is only counting the Twitter feuds." Trump has also praised some totalitarian leaders, including that time he tweeted a quote attributed Italy's fascist dictator Benito Mussolini. Unfortunately, as Oliver noted, Trump's authoritarian persona is alluring to many American voters. So what keeps the country from devolving to an authoritarian state? Oliver said U.S. institutions have been "just strong enough" to hold up, though Trump is "surely testing the system." "While we may talk about institutions being strong, what that actually means is that people are working very hard to protect them, and to use them to contain this presidents' worst impulses," Oliver said. Check out the full clip below.